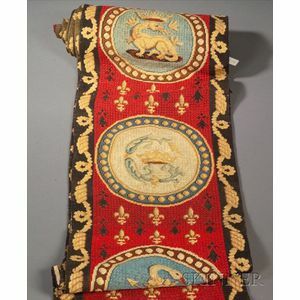 Two Wool Needlework Coat of Arms Panels, mid to late 19th century, worked in wool yarns on a linen backing, the long panels each depicting seven round reserves with coats of arms and fleur-de-lis and sprigs on a red ground with looped and coiled rope border, (toning, one end frayed), 9 ft. 8 in. x 14 1/2 in. 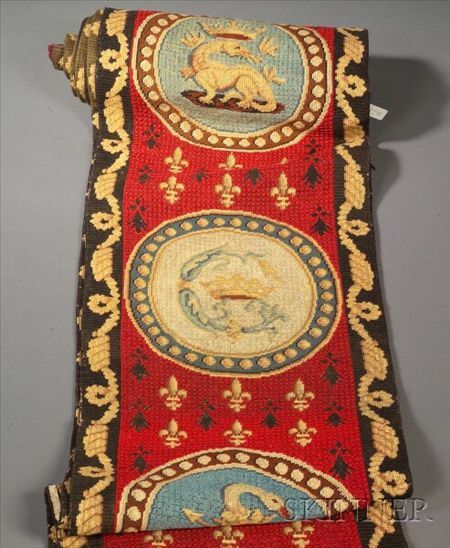 Note: A tag attached to one of the panels is inscribed "Embroidered by Rosalie Forbes born 1822-died 1894 (or 6)."